Why Syria & Jordan at this impending hour of war? Where have you brought me to you Ulloos! (Raj) Saif is smiling now after he had given the rock like pillows a severe beating. He orders up two more expecting them to be much softer. But no such luck - they were made of the same stubborn stuff. 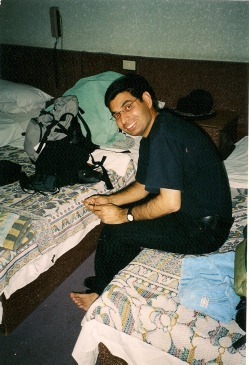 At that time there were few hotels to choose from. 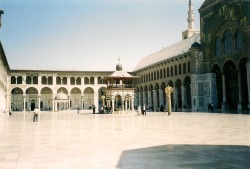 Who in their right mind would want to go to Damascus? Since then I have been there twice and things have improved. Not that there are any more tourists but more business people pay a visit. (Raj) Well he seems quite happy! At least the bathroom is clean and odourless. (Raj) I like it! And there is a balcony to have a cold beera on and take in the atmosphere! 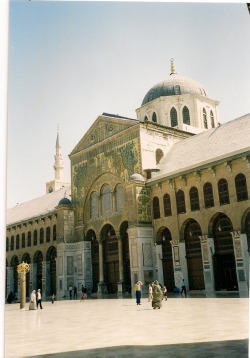 (Raj) Our second day in Damascus and we visited the grand Omayyad Mosque. Important to both Sunni and Shia Islam alike. It was a bright sunny early afternoon and the Azan for the Dhur prayer was being called. Not by one Muezzine but at least three by the sound of it. Perfect in unison and the Azan resounding beautifully about the settings of the mosque. We were just outside the main gate when Saif said he wanted to pray. So Samji and I decided to wait for him until the prayers were over and he would rejoin us for a sightseeing tour inside. While we stood about chatting a man came over and told us to go in. 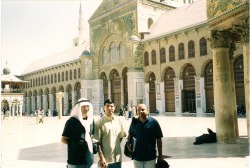 We told him that we were non-Muslims and did not want to enter during the time of prayer. He left only to return a moment later and again asked us to go in. We showed our reluctance but he insisted and asked us to follow him. He told us to take off our shoes and leave them with an elderly gentleman sitting at the enterance threshold. 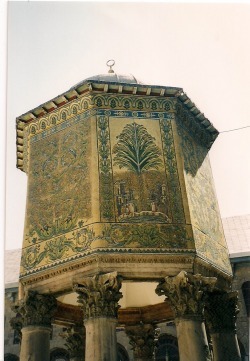 Having walked into the splendid courtyard we stood looking in amasement at the grand size and beauty of the building. The man told us to go into the prayer hall. 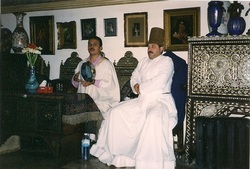 We again declined reminding him that we were not Muslims and wanted to respect the prayer time. But he insited on taking us in. We followed feeling somewhat apprehensive. Inside the individual Namaz had already commenced. He asked Samji what religion he was. Samji told him he was a Hindu. "Do you want to pray?" asked the man. Samji politely declined and was invited to sit at the back of the congregation and watch. The same question was then put to me. "I am a Sikh" I responded. "Ah" said the man, "I know many Sikhs from my stay in Southall some years ago". "You believe in one God". I responded that that was the case. So came another invitation this time for me to join in the prayer. I took up the offer and went to stand in the line of men which was now assembling at the front facing the Mehrab - the direction to Mecca. Then the congregational Namaz commenced. Well, I had done this once before so I knew what to do. Unless non-Muslims have seen this in its entirety they will have no idea of the right way to go about this. Even with the past experience I still had to keep an eye on my neighbour to make sure I did not slip up. Throughout the proceedings, an elderly grey bearded gentleman on my left, murmurred Quranic verses. I could say nothing but tried to at least to keep God in my thoughts and at least wisper "Allaha hu Akbar". With the prayer over, and Saif nowhere yet in site, the man told us "You see we are not all extremists as the people in the West think of us, you can come here anytime and join in and nobody will object. Look behind you. There are even women who prayed behind the lines of men! Not seperated form them as in other mosques". For me it was quite an honour to have been invited to join in and my experience was an uplifting one. Saif appeared and the man became our de facto guide for the afternoon. He asked for no fee and at the end just took what we offered him. Pocketing the roll of notes without even counting them. We already liked Syria!! (Raj) Damascus came as a complete surprise. Its people welcoming, warm, relaxed, helpful, hospitable and curious. "Why" we were asked a few times "does your Prime Minister side with President Bush to bomb Iraq? We can understand Bush wants to do it since it is only Saddam Hussain who stands up to him in the Middle East but why Blair? " We tend to shy away from politics when visiting "sensitive" countries and made feeble excuses of not being completely aware of the intention of such leaders to make war. We tried to remain neutral and told the Syrians and Jordanians that we loved their countries at which point the conversation would take a turn to the topic of what we liked about them. Both are a proud people who genuinely admire and respect their leaders...... or so it seemed then! (Raj) Is Raj trying to blend in with the locals? Not making a convincing job of it! 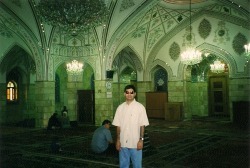 (Raj) We vist the Sayyidah Zaynab Mosque. Zaynab was the daughter of Imam Ali and Fatimah. That makes her the grand daughter of the Prophet. 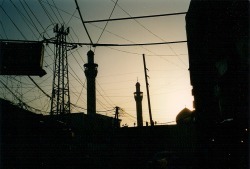 The magnificent architecture is of course Iranian and, although the mosque is Shia, other muslims come to worship here. 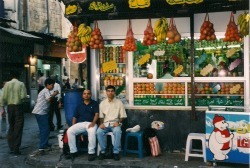 The bazaar outside was lined with small stalls and shops selling religious paraphernalia. 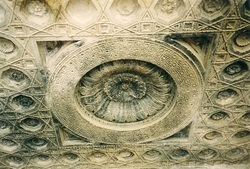 (Raj) The interior of the mosque is as ornate and exquisite as the exterior. 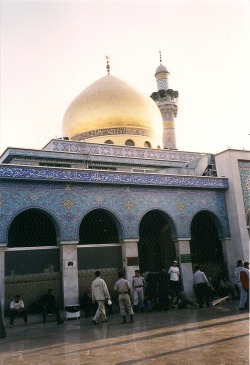 It houses the shrine of Zaynab where she is said to be buried. (Raj) In a lot of warm countries we drink freshly squeezed fruit juice. Plenty of variety to select from. Always refreshing. Curious cartoon of a snow man - in Syria of all places!. (Raj) Taken from the bazaar adjacent to the mosque where stalls and small shops sold religious paraphernalia to the pilgrims. 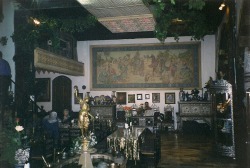 (Raj In the evening, quite by chance, we found an excellent restaurant on one of the narrow streets of the old city. Decorated in quite a grand style. Syrian food is fantastic and for Samji's sake they also have a great choice of vegetarian dishes - as on that evening. We were spoilt for choice and with it a good spread of desserts. 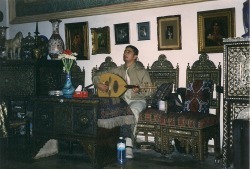 (Raj) Son plays the mandolin and sings. (Raj) Unlike what we would see in Egypt this is a genuine performance. 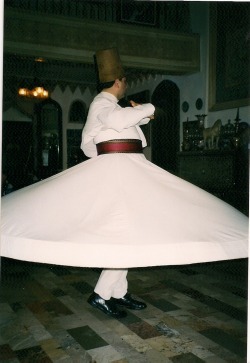 They are indeed from a Sufi family and carry out the dervish spinning dance for real. 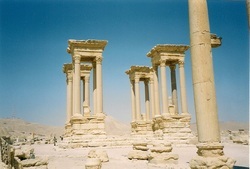 (Raj) Before we leave Syria, we visit the vast ruined city of Tadmor. Even in it's pressent condition it is impressive. The place became a wealthy city state benefiting from the trade that flowed between the Roman Empire, Persia, and India. (Raj) The huge Temple of Ba'al offers some insite into what this civilisation was capable of constructing. 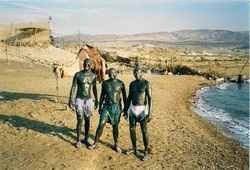 (Raj) They say it's good for your skin so we got covered in Dead Sea mud. What a sight! 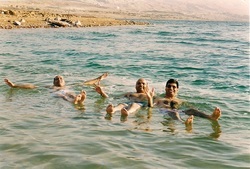 (Raj) One can't really swim in the Dead Sea. As you walk in, the water lifts you up and you just float about. Heed the warnings about avoiding getting the water in your eyes or mouth. I slipped when getting out and took the full force by having my eyes burnt and swallowing a good mouthful of the most acrid fluid I have ever swallowed. The immediate, reflex reaction, involveed much vomiting. This kept going even when all the nasty liquid had been expelled. Once over, I wanted to eat bananas and drink fruit juice. This did not help as I lost the ability to speak, which only partially returned after dinner at about 11 p.m. I thought I would wake up the next morning with a sore throat but to my surprise, the next day, I was competely cured! (Raj) It is post 9/11 and the tourist industry here has fared very badly. We hire a taxi and the young driver is badly in need of some business. 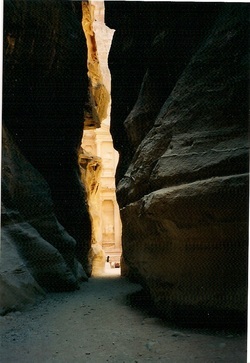 He takes us to a site called "Little Petra". Not as grand as Petra but worth a short visit. This excursion is not purely for our benefit but for the taxi driver to do his best for us to hire him for the next day (when we go to Petra), and the following day when we plan to go to Wadi Rum. We tell him we'll think about it. He then offers us an evening out where tourists will enjoy a barbecue - at a price of course. We politely decline. Here an old man shows us what he claims are ancient Nabataean coins. He tells us he picks them out of the mud when the rains reveal them. There are about five miserable looking coins in a rusty tobacco tin. I pick out a shiny one to take a closer look. This is a mistake! 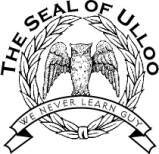 "We never learn guy" Ulloo moto is about to be proven true. After we look about the site the old coin man is waiting to join us. I am of course singled out as the one who will buy his coin. It is, he tells me 100 USD but he can give it to me for 60. I try my best to ignore him. As the distance between us and the taxi gets shorter so the gap between 60 USD to somewhere close to zero USD gets narrower. Just close to the taxi it has fallen to 20 USD. But now I am being told a truly sorrowful tale. A narrative of lament. Tourists no longer come here, people are poor and getting poorer, there is no money, his grand children sit at home and the family cannot afford to send them to school let alone feed them adequatley. This magic works as images of my "have-it-all" life in England flash before me. Of course I give in, take the shiny coin, and hand him 20 USD. This does not go unnoticed by our driver who now thinks there is for sure money to be made! 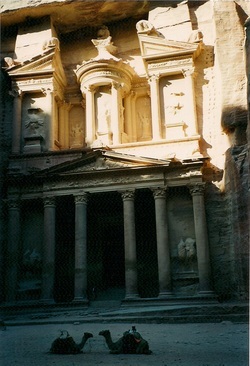 (Raj) PETRA: It was already quite a warm sunny morning and would become almost unbearable by mid-day. We walked to the site at Petra. No history needs to be related here only our experiences. (Raj) But I don't think anyone has the remote idea what it was used for. An old man approaches me and opens a rusty old tobacco can containing a few misable looking coins. As he begins his tale of Nabataean coins washed out of the ground by rain (must rain a lot in Jordan) I spot a shiny looking coin identical to the one I had bought the night before. I am also staring at a face identical to the one I was looking at last night! "Ah, it's YOU!" I tell him and walk off. What did I say? "We never learn guy!" (Raj) We are ready for departure to Wadi Rum but not before another encounter with the driver who took us to see Little Petra. 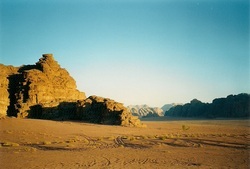 We did not need him for Petra (walking distance from hor hotel) and we do not need him for Wadi Rum. He's sitting having coffee with his friends and spots us in the street. 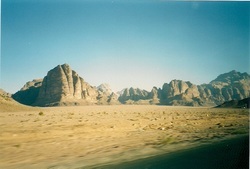 (Raj) The rocks of the Wadi change colour through the day. Starting almost gray at midday they travelk through all shades of the spectrum from yellow to red as the sun sets. It's also a calming and peaceful experience. We decide to hire a tent for the night - not out on the sands but in the back yard of a bar/restaurant. 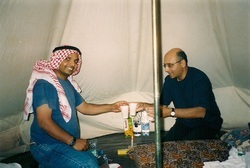 (Raj) Raj the "Daroowallah" has set up a bar in the tent. A choice of drinks is on offer. Various fruit juices with or without voddies. There is no electric lighting so we will drink in romantic candle light. (Raj) Samji has odd intentions so I'm keeping well clear of him! Samji! Put away those tools! Aqaba - but how to get there? 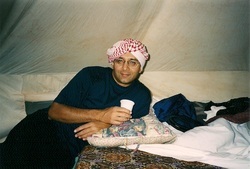 (Raj) At sun rise, what had been our pleasant tent, turns into a furnace and we quickly jump out to go to the bathroom. After breakfast, which includes a cool beer or two, we enquire about transport to Aqaba. A bus would do but we are told today is a national holiday and no buses are running. "What about a taxi?" we ask. That will be very difficult to find in the small village we are staying in. I try to look for someone willing to drive for us and find an old man sitting inside his jeep, the only one available. He cannot speak a word of English but me pointing at his jeep and saying "taxi" is, at least, understood. He shakes his head. Now we are in some trouble as our flight from Amman leaves at 3.00 in the next morning. Thoughts of being stranded here pass through my head. 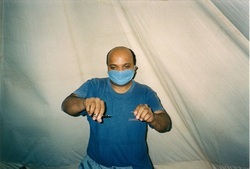 The man jumps out and gestures that I should follow him. We reach a house and he knocks but there is no reply. He goes round the back and jumps over a wall and into the garden. Bangging on the door rouses no response. No one is at home. He jumps back into the narrow alleyway. I am to follow him. For a man his age (I guess reaching or having reached seventy) he is as active as a teenager! And a teenager he finds in a small cafe fogged by smoke from sheeshas and cigarettes. The boy takes out his mobile and makes a brief call. The old one gestures that I follow him and we are back at the camp site. I have no idea as to what is going on. He speaks to the manager and the manager translates that a driver will come to meet us but when he cannot say. Oh well, time for another couple of beers with thoughts that we will not make it to Amman that day. Within about an hour a driver turns up. He speaks English and we ask him to take us to Aqaba. He readily agrees and we settle on the fare. 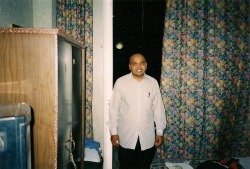 At Aqaba, the driver drops us off at the shore of the Red Sea and asks us if he can take us to Amman once we are ready. We decline his offer but he warns us that we will not find any taxis operating and, having been paid, drives off. Saif and I decide to have a dip in the sea while Samji waits under the shade of a small hut. When we return to hail a taxi the road is empty of any traffic. No vehicle passes us. The wind stirrs up sand that blows around us. About fifteen minutes without any luck a car makes its way towards us. The driver stops when he reaches us and winds down the window. "I told you you would not get a taxi! I have been watching you!" Our saviour has returned as we agree the fare for Amman. But before we go to Amman the driver invites us to meet his family and have lunch with him. At home he introduces his sons and a shy little daughter and tells us about his children and the plans he has for their education. He will not send them to universities in the West where they will pick up all sorts of nasty habits but to a country that has a culture similar to Jordan. His son brings the lunch while we discuss politics and the plight of the Palestinian refugees living close by. They have no jobs and live by selling petrol on the black market. After lunch, we are taken to the roof top to survey the area populated by the Palestinians. We do not see his wife. 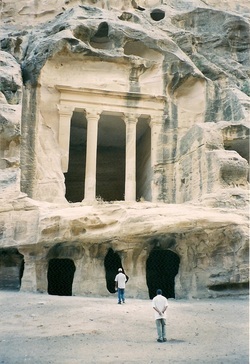 We reach Amman at around 9 p.m.
(Raj) Yes, it has been a long and demanding day! While Samji and Saif have a kip I decide to stay up and read while supping red wine. 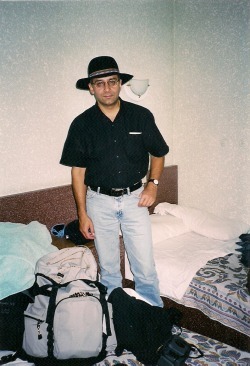 For me there is no point in trying to sleep for a few hours before taking our taxi, booked for one a.m. to the airport. This has been a fantastic trip and we have done and seen a lot while having agreat deal of fun.